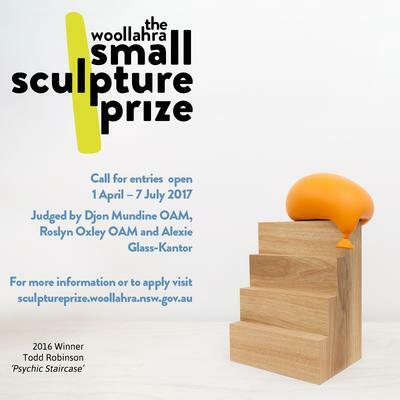 The 2017 Call for Entries is now open for the 17th Woollahra Small Sculpture Prize. Artists are invited to present images of their proposed or completed original and freestanding sculptures. The submitted art works must also be non-site specific, three-dimensional and constructed of durable materials up to 80cm in any dimension. Total prize money for the Woollahra Small Sculpture Prize has increased this year from $19,000 to $24,000, awarded across four categories: the main Acquisitive award ($20,000); Special Commendation award ($2,000); Viewers' Choice award ($1,000); and Mayor's Award ($1,000). Last year we received 614 entries from national and international artists. A total of 46 finalists' works were presented in the exhibition, with the main award going Sydney artist Todd Robinson for his work, Psychic Staircase, an eight-kilogram plywood staircase atop which sits an orange balloon that droops as the force of gravity appears to bear down on it. Psychic Staircase originates from an ongoing series of balloon inspired sculptures by Mr. Robinson that explore sculptural presence, materiality and conditions of audience reception. Entries submitted online are encouraged. You can complete your entry online and pay the AUD$45 fee by credit card or PayPal. Download and complete the 2017 entry form (PDF). Enclose a cheque, money order or receipt from PayPal for AUD$45 inclusive of GST per work, made payable to Woollahra Council. 1. For the purpose of The Woollahra Small Sculpture Prize, sculpture is defined as a freestanding, non-site specific, three-dimensional object. Only freestanding works will be accepted for selection. 2. Entries should not exceed 80cm in any dimension, and must have a stable base. The overall weight and dimensions must allow for easy transportation, and not exceed the carrying capacity of two average persons. 3. All entries must be the original work of the submitting artist and must have been designed or completed within two years prior to October 2017. 4. There is no limit to the number of entries an artist can submit. A separate application form and entry fee must accompany each entry. Only one work per artist will be shown in the exhibition. 5. A non-refundable entry fee of $45 (including GST) must accompany each entered work. Entry fees contribute towards the cost of staging the Prize. Woollahra Council reserves the right to cancel or postpone the Prize and exhibition, in which case the entry fees will be refunded. We have announced three high-profile guest judges who will oversee Australia's pre-eminent national award for small sculpture for 2016. This year's judges are Djon Mundine OAM, Curator/Writer/Artist and Activist, Roslyn Oxley OAM, Gallerist and Arts Benefactor and Alexie Glass-Kantor, Executive Director of Artspace Sydney and Curator of Encounters at Art Basel, Hong Kong. Our 2017 judges will continue the custom of the Prize being judged by a diverse and respected group of arts professionals, collectors, artists and art patrons.